Remittances to Bangladesh have been growing steadily over the last decade. Since its independence in 1971, more than 3 million Bangladeshis have left the country in search of employment. 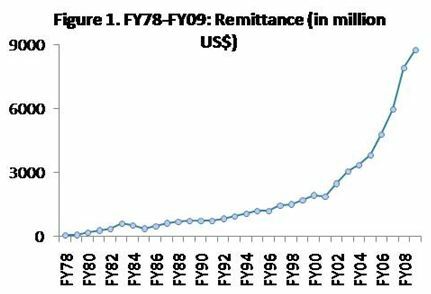 The central bank estimates their cumulative remittances during 1976-2003 at round US$22 billion (Azad, 2005). Recognizing their economic importance, the government for years has had legislation, policies, and an institutional structure in place to facilitate the migration of its citizens. Now the question is why sudden importance is put into the perception of remittances? The fact is that the absolute and the relative volumes of workers’ remittances are increasing. They have shown a steady increase over the last decade. The amount of remittance flows to developing countries already surpassed that of official resource inflows. Since 1999, workers’ remittances have been the second largest resource flowing into developing countries after foreign direct investment (FDI). In addition workers’ remittances are not liabilities but cash transfers from overseas, which in principle, they do not cost any to recipient countries. As there has been much debate about external debt and its negative effect on growth, this feature is very attractive force. Despite the growing interest in workers’ remittances, the role of remittance in development and economic growth in general is not clearly understood. For example, studies based on a country’s time-series data tend to find positive impacts of remittances on growth, but a cross- country/panel data study by Chami et al. (2003) shows the opposite outcome. This is still one of the least studied areas of research in migration literature. Despite the expanding literature on the subject, there remains an inadequate understanding of a number of issues related to the flow and use of remittances. Thus, there has been little work on the impact of remittances on the overall economy. The major labor exporting countries follow different conventions on whether to include remittances from overseas workers as a part of the net factor income in national income accounts. The resulting GNP estimates (GNP= GDP + Net factor income from abroad) therefore are not comparable. Amongst the major Asian labor exporting countries, GNP estimates published by governments in India, Sri Lanka, and Thailand exclude workers remittances while Bangladesh, Pakistan and Philippines include them. In this report, an attempt has been made to clarify concepts relating to the affect of workers’ remittances on the overall economy of Bangladesh. As Bangladesh is among the few countries that include workers’ remittances separately in their gross national income estimates, it is important to identify the impact of remittance on the national economy. In order to understand the effect, this paper integrates remittance in the national income accounting framework. Remittance is the second highest productive sector of GDP growth of Bangladesh after RMG (Ready Made Garment). So it has a great importance to the economic development of our country. The remittance process is a little complex and commercial banks cannot do all the necessary works to make it easier alone. So it has some problems and this is where I want to work with the help of my internship program in NCC Bank Ltd. This report mainly emphasizes in remittance and foreign earning related activities of NCC Bank Ltd. However, the report also cover brief overview of NCC Bank Ltd, its products, services, operating activities, financial position, performance analysis and SWOT analysis of the Bank. To find the way NCC Bank Ltd works with the process of inward remittance. To find and mention the role of NCC Bank Ltd on the remittance earned by Bangladesh. To find how NCC Bank is dealing with the problems existing through the remittance earned by Bangladesh. To analyze how the remittance is productive to the economy of Bangladesh. To mention the role of remittance to the GDP (Gross Domestic Product) growth of Bangladesh. To analyze how remittance helps to increase the foreign currency reserve of Bangladesh Bank. To offer recommendation for further development of NCC Bank Ltd. Analysis on remittance is not quite enough by analyzing only the procedures and activities of NCC Bank Ltd. Since then I have been interested to work with NCC Bank Ltd because of their role on the foreign earnings of Bangladesh. The information and data for this report have been collected from both the primary and secondary sources. Face to face conversation with the respective officers and stuffs of the branch. Face to face conversation with clients visited the branch. Relevant study as provided by the officer concern. Website of NCC Bank Ltd. Annual report of the bank (31st December, 2008). Different procedure manual published by NCC Bank Ltd. The officials have some times been unable to provide information because of their huge routine work. Some data could not been collected for confidentiality or secrecy of the management. Due to budget constraints, the survey could not be made up to desired level. National Credit & Commerce Bank Ltd. (NCCBL) did not provide any kind of pay and allowance for the period of internship, which is very unethical. Although I have put the best efforts to meet the report objective however due to the short period of time the detail information gathered May not possible. Finally, my personal scantiness of knowledge especially in research, studies and banking activities. Although remittance plays a very vital role to the economy and the GDP growth of Bangladesh, since then it has been a very little scope for me, because it is a limited section of general banking system of any bank. P. S = Payment slip. Banking sector plays a dynamic role for the development of national economy. It works as intermediary between depositors and borrowers. At present there are 48 banks in Bangladesh. NCC Bank Ltd is one of the top ranking banks in Bangladesh. The objective of this bank is not only to earn profit but to do good and welfare to the people, society and community upholds the concept that money, income and property and wealth are to be used for the good of the society. NCC Bank operates on commercial bank principles of profit maximizing with the cooperation between the bank and the customers or clients of the bank to reduce the exploitation and the large scale inflation and unemployment. NCC Bank is committed to do away with disparity and establish in the economy, trade commerce and industry build socioeconomic infrastructure and create employment opportunities. National credit and commerce Bank Limited was incorporated in Bangladesh as a banking company on under the company’s act 1994, The Bank started its operation as on 1985 year. The principal place of business is the registered office at 7-8, Motijheel Commercial Area, Dhaka 1000. It has 57 branches all over Bangladesh. The Bank is listed in the Dhaka and Chittagong Stock Exchanges as a publicly quoted company for its shares. With its firm commitment to the economic development of the country, the Bank has already make a distinct mark in the realm of private sector banking through personalized services, innovative practices, customer services, dynamic approach and efficient management. The Bank, aiming to pay a leading role in the economic activities of the country, is firmly engaged in the development of the trade, commerce and industry through a creative credit pricy. NCC Bank has also positioned itself as an established Correspondent Bank. Through a worldwide network of 260 correspondent banks NCC Bank is present in all key areas of the globe. It operates its business activities with satisfactory interest rates on deposits as well as on loans, credits and investments. It is run according to rules and regulations formed and amended by Bangladesh Bank. It is based on interest like other commercial banks. It provides loans for investment in the business and thus for social welfare and reduce unemployment problem. It is one of the leading ranked commercial banks of Bangladesh. It leads all of its transaction according to commercial banks law. It also acts as a brokerage house of stock market. NCC Bank doesn’t deal only with the interest income through loans and credit sales and distribution, but also works as a reputed financial institution through money of the clients and customers of the bank. NCC Bank does not have the goal of earning profit using the money of its customers and clients through the distribution of their deposits as loans and credits, but also to make welfare to the people, society and community. It upholds the concept that money, income and property and wealth are to be used for the good of the society and the country. It operates on the basis of general and common principles of commercial banks and also on the basis of the rules and regulations of Bangladesh Bank, to avoid exploitation and reduce large-scale inflation and unemployment problem of Bangladesh. It is committed to abolish such disparity and establish justice in the economy, trade, commerce and industry build socio-economy infrastructure and create employment opportunities. National Credit and Commerce Bank is a conversion of erstwhile National Credit Ltd (NCL), an investment company largest of its kind in the established on 25 Nov 1985. National Credit and Commerce Bank Ltd. started their new journey with the paid up capital of 5.00 crore taka of that time. But present paid up capital of the Bank stands at BDT 175.76 crore. To mobilize financial resources from within and abroad to contribute to agricultures, industry and socio-economic development of Bangladesh and to play a catalytic role in the formation of capital market. High quality financial service with the help of latest technology. Attract & retain quality human resource. Achieve balanced growth & equitable development. High standard business ethics & ensure equity justice in economic activities. Extend financial assistance to poorer section of the people. Steady return on shareholder equity. The Bank’s vision is to always strive to achieve superior financial performance, be considered a leading Commercial Bank reputation and performance. However the corporate vision of the NCC Bank Ltd is to become the Bank of Choice in serving the nation as progressive and socially responsible financial institution by bringing credit and commerce together for profit and sustainable growth. To provide quality services to the customers. To set high standards of integrity. To extend our customers innovation services acquiring state-of-the-art technology blended and brings total satisfaction to our clients and employees. Ensuring justice to both suppliers of fund (depositors) and user of fund (investment takers). To conduct the highest percentage of interest on deposits and lower percentage on loans and credits distributed for further investment. To establish participatory banking instead of banking on debtor creditor relationship. To invest through different modes of business. To accept deposits on interest as high as the customer can be satisfied comparing to other commercial banks. To extend co-operation to the poor, the helpless and the low-income group for their economic development. To contribute towards balanced growth and development of the country through investment operations particularly in the less developed areas. To contribute in achieving the ultimate goal of commercial economic system. On the occasion of 21st February 2007, a reception was given to Language-Veteran Mr. Abdul Matin at Jatio Jadughar Auditorium. To help the flood and Sidr victims, the Bank has donated BDT 1.10 crore to the Chief Relief Fund and Relief Fund of the Chief of Army Staff. The Bank has distributed blankets to the destitute people of southern part of the country to help them in coping with severe cold wave. To help the victims of BDR carnage the Bank has donated BDT 2.5 million to the Prime Minister’s Relief Fund. To extend help to the family of late Lt. Col. Lutfor Rahman Khan, a victim of BDR incident, the Bank will pay BDT 40000 per month for a period of 10 (Ten) years. Books of different taste have been distributed to educational institutes of remote areas of the country on the occasion of 21st February, 2007. Scholarship offered to 5 (Five) meritorious students of Faculty of Business Studies, University of Dhaka. Under the banner of the NCC Bank Foundation, the bank distributed educational materials to poor students of Dahagram and Angorpata enclaves. Awarded scholarships to talented but distressed students and grant assistance to the off-springs of the Bank’s employees. The Bank sponsors Viqarunnessa Noon School & College Science Fair. With a view to assisting destitute people in treatment, the Bank extend subsidy to a City Hospital. The Bank sponsored Inter-District Volley-Bal Tournament-2007 onward and Dhaka University Convocation. The Bank published souvenirs on the occasion of ICC World Cup Cricket and World Cup Football to distribute among the sports loving people free of cost. The Bank has been sponsoring Bangladesh Cycling Federation to help popularizing Cycling in Bangladesh. The Bank has sponsored/co-sponsored a number of Seminars/Symposium on topics concerning various social and economic issues which paved a way of looking at the picture from different angles. Countries northern part is always believed to be a backward region where threat of famine, popularly known as ‘Monga’, looms as there is little scope of employment during dry seasons. To help the people of the area, the Bank extended credit facilities under flexible terms for cultivating maize. The Bank maintains transparency in its entire works. All decision of the management comes through discussions in appropriate forum and required follow-ups are also made to see their effectiveness. To train up the fresh appointees, the bank undertakes various training programs in its training institute. Further, training is arranged for making other officers acquainted with changing atmosphere of the sector so as to enable them to be on the race. The bank is always concerned to keep up its good image through various promotional measures. 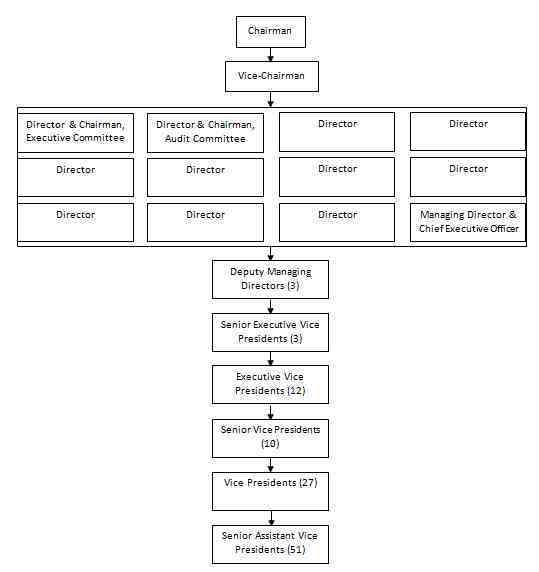 The number of Directors in the Board is 13 (Thirteen), which is within the maximum limit imposed by Bangladesh Bank. The position of the Chairman of the Board and CEO are filled by separate individuals. It has an Executive Committee and an Audit Committee of the Board to support the Board in taking decision on various important operational matters headed by separate persons as their Chairman. The Board reviews and approves short and long term strategic corporate businesses plan for compliance by the Management. The Board/Executive Committee reviews the policies/guidelines issued by the Central Bank regarding operation of the sector. The Board/Executive Committee of the Board approves the credit proposal as per approved policy and Bangladesh Bank guidelines/regulations. The Board also reviews the action plans implemented by the Management. The Audit Committee reviews the audit report of the Branches and other functions in its regular meetings and advises the Management for development/correction. The Committee also follows up implementation of its various suggestions/decisions on regular basis as per Bangladesh Bank Circular. The Management operates within the policies, rules and delegations approved by the Board and complying other regulatory requirements. Managing Director and Chief Executive Officer (CEO) heads the Management & Executives of various Divisions/Departments are engaged in currying out decision within the norms and rules of the sector. The Bank gives priority in submitting periodical statements to Bangladesh Bank regularly and other regulatory bodies in time to enable the stakeholders to make correct assessment of company’s affairs/profitability. Bank’s Information Technology Division is one of the organized wings of the Institution headed by an Executive Vice President; the Division is engaged in designing various softwares to ease customer service. Where deem expedient, the Division acquires software from outside to suit the need. With the active support of the Division, it was possible to introduce Real Time Online Banking System in the bank within a very short time, which received remarkable response from customers since this makes their life style easier. The branch network of the Bank has reached to 57 in 2008 with the opening of 4 (four) new branches. Bangladesh Bank was approved opening of 10 more branches and 5 (Five) SME Service Centers in 2009. Considering proposed appropriation of profit for the year, the Board of Directors has been pleased to recommend 30% Stock Dividend for the valued Shareholders for the year 2008, subject to approval of the Shareholders. The Board and the Management of the Bank sincerely recognize importance of managing various core risks involved in the business and employ efforts to cover the risks. The core risks area are handled by skilled and professionals under leadership of experienced Bankers in the technology based atmosphere. In order to address problems in this regard, various committees are active to comply with the laws and regulations of the land. Bank’s separate Audit & Inspection Unit under Internal Control and Compliance Division engaged in identifying any sort of lapses/irregularities in the branches as well as suggesting corrective measures against them. Branches are being audited in regular interval, at least once a year under set norms. There is also an MD’s Vigilance Team to conduct surprise inspection as and when directed by the Managing Director. Final impact of financial meltdown in the World Economy was at last felt severely in 2008, which formally, so to say, started with the collapse of world famous financial service provider the Lehman Brothers Holdings Inc. of the USA. Then there started the phenomena called the Credit Crunch: unprecedented in World Economy since “Great Depression” of the 1930’s of the last century. Economies of advanced countries came down one after another like a house of cards, specially the USA, which suffered most, culminated into closed down of several Banking and Financial organizations and large scale retrenchment in employment sector. In order to revive the shattered economy, the new democratic government of President Barack Obama, which came into power with the slogan of “Change”, undertook an ambitious economic recovery plan of 890 billion US dollar. Other European nations have also been considering to take similar steps to bail out of this crisis. The E.U. countries are also negotiating to chalk out a workable plan in this regard. Bangladesh Economy has a unique character of resilience that always helps in coming out of adverse situations. This has been proved several times in the recent past either in the face of devastating floods or ravaging cyclone storms. However, this time the cause of alarm is different in nature and it is apprehended that country’s economy may suffer ripple effect of the global slowdown in respect of Foreign Remittance, export of manpower and RMG, etc. The newly elected government that came to power through the widely participated elections of December 2008 is aware of this and contemplating various options to save the nation from the adverse effect of the recession, which include diplomatic efforts to expand manpower market in other parts of the world as well as to hold the present market by persuading the manpower importing nations, searching for new markets for RMG and efforts to keep the flow of remittance unhindered. An all party committee has been formed to put up recommendation to the government to save our economy from the grip of this crisis. The business community has recently proposed the government of BDT 6,000 crore to bailout. Some intellectuals, however, see prospect for Bangladesh in this situation and advised to grab the same in time and be prepared for seizing the opportunity. However, there was a panic in the minds of the entrepreneurs regarding economic slowdown, which caused negative impact on industrial sector. Also crisis in power sector added to this, there is no indication that the situation would improve in near future. Address of Dhanmondi Branch Quality Center, 744, Satmosjid Road, Dhanmondi – R/A, Dhaka. To extent other banking services. To conduct social welfare activities through Commercial Bank Foundation. To extend the benefits of the investment of the bank under the scheme to different sections of the people. To assist in solving the existing housing problem of the country. To assist the service holders and professionals with fixed income to arrange for houses of their own. To extend investment facilities of the bank to every nook and corner of the country, by size of investment, by sector of investment and on the basis of geographical area. To make investment facilities easily available under commercial banking rules and regulations to those people who do not want to avail investment facilities with less return on their deposits. All activities are conducted on interest and profit based system according to commercial bank principles. Aims to introduce a welfare-oriented banking system and also establish equity and justice in the field of all economic operations. Extend socio-economic and financial services to individuals of all economic backgrounds with strong commitment in rural uplift. Plays a vital role in human resource development and employment generation particularly among the unemployed youths. Portfolio of investment and investment policy have been specially tailored achieve balanced growth & equitable development through diversified investment operations particularly in the priority in sectors and in the less developed areas of the national economy. The principles and working procedures of NCCBL are comparatively different from the the other commercial banks. There is an inevitable need for training of the employees of the banks to orient and attune them to the new system of commercial and credit oriented banking, to cater to this need, NCC Bank continuously train-up the new and existing employees over the years. The train-up program gives various type of training on different subjects including economics, banking, comparative philosophies and journals of home and abroad and research articles and documents. Employees of the Bank, learners and researchers have been taking full advantage of the training program. A motivated, self propelled and committed workforce is gem for any financial institution, especially like NCC Bank Ltd. where success essentially depends on personalized service to satisfy diversified needs of the people. For this improving quality of manpower is essential. The management of the bank recognizes this and has taken various steps of motivate its employees of different strata and so as to involve them in overall growth through achieving short and long term goals. Imparting training, both in-house and outside and abroad also are some ways to equip the people with the updated knowledge of Banking and global situation to understand the changing world. During 2008, Bank’s Training Institute has arranged total number of 44 programmes, workshop, seminar etc. on a wide range of topics where 538 numbers of officers/executives attended. Total number of executives & officers as on 31.12.2008 was at 1118 as against 956 of 2007. Banker-Customer relationships in NCC Bank Ltd is based on arrangement satisfactory interest rates in both credits and deposits. The commercial banking system prescribes how a society is to be organized, what will be the relationships of its members, and how the affairs of the members are to be conducted. Accordingly, the relationship between a banker and a customer was established under the commercial banking system. Better customer services can ensure better relationship between a banker and customer. Logically, customers can claim some services as debtors, creditors, buyers and some as fellow men in general. NCC Bank tries to satisfy the needs of the above parties. To give the legal shape to the banker-customer relationship in banking transactions, some existing conventional banking laws and related laws need to be changed. Domestic credit increased by BDT 4.80 crore or zero percent to BDT 270406.90 crore during December, 2008 compared to the previous month. Domestic credit increased by BDT 21639.00 crore or 8.70% during July-December, 2008 against of increase of BDT 20906.00 crore or 10.16% during the same period of the previous year. The increase of domestic credit during the current period was mainly due to an increase of credit to the public sector by BDT 7242.40 crore or 12.35% as compared to the increase of BDT 5118.00 crore or 9.57% in the same period of the previous year. Credit to the private sector also increased by BDT 14396.80 crore or 7.57% during July-December, 2008 as compared to the increase of BDT 15788.00 crore or 10.37% in the same period of the previous year. Bank follows its own credit policy formulated in the light of country’s applicable laws & norms and CRM guidelines as well. The main focus of the policy is to ensure profitable and viable investment of Bank’s fund. Besides conventional lending, Bank also stressed on funding unconventional sectors. In some instances, it has become pioneer in extending credit facilities such as maize, agor, saya etc. As such, the credit portfolio of the Bank is well diversified and covers wide spectrum of business and industrial concerns from textile to real estate. Credit facilities in micro and SME sector is also gaining momentum. The bank is very careful in handling credit proposals, Bank disbursed BDT 56996 million during the year and Deposit Advance ratio was 98.78% in 2008. As per CRM guidelines the role of Credit Administration Division is vital in streamlining credit of the Bank. The Bank has recognized this and take steps to strengthen the department by posting competent officials with specific assignment of monitoring offsite basis. As on 31st December, 2008 Bank’s investment stood at BDT 6526.82 million recording an increase of 4.15% over last year’s BDT 6266.62 million. Generally Bank invests its fund in Government Treasury Bill in order to maintain statutory liquidity requirement (SLR) besides yielding good rate of return. AS usual, Bank’s Foreign Exchange Business contributed largely to its profitability I 208 also. The management of the Bank is careful in catering to the Banking needs of the exporters and importers and as such always tries to depute competent officers having required expertise in the field. As a result, Bank’s foreign trade witnessed impressive development last few years. During 2008, the Bank handled export and import businesses for BDT 12522.04 million and BDT 38796.88 million respectively. Number of Bank’s Add Branches was 20 (twenty) in 2008, which is expected to increase by 03 (three) Branches in 2009. Through dealing room operation and effective fund management, the Bank could earn BDT 311.07 million during the year against BDT 282.60 million of the previous year. NCC Bank has the unique opportunity to have country’s first ever trading house titled “NCC Bank Brokerage House” to operate in the capital market as well as facilitate trading in a free and automated system. During last few years, the “House” could inspire potential traders to avail of the opportunity of trading without going to Stock Exchanges. Inspired with the initial success of the House, Branches have in opened in Dhaka, Chittagong, Khulna, Rajshahi and Feni Regions. More Branches are going to be opened soon. The operational profit of the Bank as on 31st December, 2008 was BDT 2363.49 million against BDT 1780.24 million of 2007, rate of growth being 32.76%. Return on Assets (ROA) was 1.54%. Revenue collection in January, 2009 increased by BDT 576.48 crore or 15.46% to BDT 4306.20 crore compared to BDT 3729.72 crore in December, 2008. During July 2008 to January 2009, 2009 revenue collection increased by BDT 2944.79 crore or 12.40% to BDT 26695.62 crore compared to BDT 23750.83 crore during July 2007 to January 2008. Exports receipts in December 2008 amounted to US$ 1195.80 million which is lower by US$ 133.50 million or 10.04% compared to export receipts in December 2007. During July to December, 2008 exports increased by US$ 1248.70 million or 19.22% to US$ 7744.60 million against exports of US$ 6495.90 million during July to December, 2007. Import payments in December, 2008 amounted to US$ 1423.50 million which is lower by US$ 17.00 million or 1.18% compared to December 2007. During July-December, 2008 import increased by US$ 1989.50 million or 23.03% to US$ 10629.00 million against imports of US$ 8639.50 million during July-December, 2007. Foreign Exchange Reserve held by the Bangladesh Bank stood at US$ 5577.10 million at the end of January, 2009 compared to US$ 6148.80 million at the end of June, 2008. This was higher by US$ 190.60 million or 3.54% compared to US$ 5386.50 million at the end of January, 2008. The annual rate of inflation decreased to 8.90% at the end of December, 2008 from 9.11% at the end of December, 2007. Bank’s performance during the year 2008 was modestly satisfactory, despite two years of uncertainty and gloomy global economy. During the year, Bank could mobilize deposit of BDT 46904.66 million and earned operational profit to the tune of BDT 2363.49 million, advance figure as on date stood at BDT 46332.69 million. Remittance of fund means transfer of money from one place to another place or one city to another city of the same bank within the country is called local remittance and fund transfer to outside the country through correspondent agent is called foreign remittance. When migrants send home part of their earnings in the form of either cash or goods to support their families, these transfers are known as workers’ or migrant remittances (Ratha, 2005). Remittances have been growing rapidly in the past few years and now represent the largest source of foreign income for many developing countries. The official data on the inflow of remittances into Bangladesh refers to the transfer of funds made by migrant workers through the banking channel (and through post offices) (Mahmud, 1989). The records of such transfers can be easily separated from other foreign exchange transactions since these take place under what is known as the Wage Earners’ Scheme (WES). According to Ratha (2005), it is hard to estimate the exact size of remittance flows because many transfers take place through unofficial channels. Worldwide, officially recorded international migrant remittances are projected to exceed $232 billion in 2005, with $167 billion flowing to developing countries. These flows are recorded in the balance of payments; an international technical group is reviewing exactly how to record them. Unrecorded flows through informal channels are believed to be at least 50 percent larger than recorded flows. Not only are remittances large but they are also more evenly distributed among developing countries than capital flows, including foreign direct investment, most of which goes to a few big emerging markets. In fact, remittances are especially important for low-income countries. Remittances are typically transfers from a well-meaning individual or family member to another individual or household. They are targeted to meet specific needs of the recipients. And thus, tend to reduce poverty. In fact, World Bank studies, based on household surveys conducted in the 1990s, suggest that international remittance receipts helped lower poverty (measured by the proportion of the population below the poverty line) by nearly 11 percentage points in Uganda, 6 percentage points in Bangladesh, and 5 percentage points in Ghana. In poorer households, remittance may finance the purchase of basic consumption goods, housing, and children’s education and health care. In richer households, they may provide capital for small businesses and entrepreneurial activities. They also help pay for imports and external debt service, and in some countries, banks have been able to rise overseas financing using future remittances as collateral. Remittance flows tend to be more stable than capital flows, and they also tend to be counter-cyclical—increasing during economic downturns or after a natural disaster in the migrants’ home countries, when private capital flows tend to decrease. In countries affected by political conflict, they often provide an economic lifeline to the poor. The World Bank estimates that in Haiti they represented about 17 percent of GDP in 2001, while in some areas of Somalia, they accounted for up to 40 percent of GDP in the late 1990s. There are a number of potential costs associated with remittances. Countries receiving migrants’ remittances incur costs if the emigrating workers are highly skilled, or if their departure creates labor shortages. In addition, if remittances are large, the recipient country could face an appreciation of the real exchange rate that may make its economy less competitive internationally. Some argue that remittances can also create dependency, undercutting recipients’ incentives to work, and thus slowing economic growth. But others argue that the negative relationship between remittances and growth observed in some empirical studies may simply reflect the counter-cyclical nature of remittances—that is, the influence of growth on remittances rather than vice-versa. Remittances may also have human costs. Migrants sometimes make significant sacrifices—often including separation from family—and incur risks to find work in another country. And they may have to work extremely hard to save enough to send remittances. According to Rahman (2001), substantial proportions of remittances are utilized by the migrants on the consumer durable items. To sum up, we can say that migrants’ families enjoy a higher standard of living and status than what it was before migration (Rahman, 2001). It is clear, indeed obvious, that the most important macro-economic impact of financial flow arising from international labor migration is on the balance –of –payments and through that on the economy as a whole. A major benefit of labor export is the balance of payments support provided by remittance (Mahmud, 1989). He also stated that, in a situation of chronic foreign exchange shortage, remittance inflows could promote investment and capacity utilization if most of the remitted foreign exchange is used for importing capital goods and essential inputs. Alternatively, increased foreign exchange availability may lead to a relaxation of controls on luxury imports. It may also lead the government to choose the easier short-run options instead of taking measures designed to strengthen the economy’s structure and reduce its import dependence in the longer run. A precarious balance of payments has always been a major constraint to development efforts in Bangladesh. The country became heavily dependent on foreign aid immediately after Independence, Particularly because of the disastrous fall in terms of trade in the early seventies and the sluggish growth in exports ever since. However, since the beginning of the eighties, the external aid inflow in real terms has stagnated or even declined. Against his background, the huge upsurge in the floe of remittances inevitably had a salutary effect on the country’s capacity to import. The role of remittances in compensating for the sluggish growth in real export earnings particularly since the beginning of the eighties is quite evident. Turning to the balance-of payments (BOP) issue, while it is widely recognized that the remittance flows from the migrants provided a dramatic boost to the BOP, the precise position is not clear (Saith, 1989). In part, this is on account of the absence of appropriately and accurately recorded data and some other problems, like the leakage or diversion of the remittances into imports. The financial flows triggered by international migration have had a dominant impact on the balance of payments of all the labor exporting countries. At a time when massive increase in oil imports and international recession put severe pressure on the country’s balance of payments, remittances offered much needed relief (Amjad, 1989). Hyun (1984) estimated that during the late 1970s a 10 percent increase in remittances led to a 0.32 per cent increase in private consumption in the long run and fixed investment by 0.053 percent. GDP increased by 0.22 percent and GNP by 0.24 per cent. Hyun also estimates that a 10 per cent increase in remittance leads to a decrease in the ratio on the current account deficit to GNP by 0.40 percent in the long run. He however argues that the immediate effect of increase in remittances is to adversely affect exports due to increase in prices and wages but the net effect in the long run would be positive. The important point to grasp is that the increase in income attributable to remittances enables the economy to realize an excess of investment over domestic savings through a corresponding excess of imports over exports with a smaller withdrawal on external resources than would otherwise be the case. (Amjad, 1989). Nayyar (1984) explains, as a result of remittance financed investments it “ may appear to be paradoxical – but it is gross national savings rather than gross domestic savings that would rise and the economy would be able to realize a excess of investment over the latter.” What this means is that the effective savings constraint on investment is not domestic savings but national savings, which take into account remittances. According to Nayyar (1984) In a situation where the departure of migrants does not reduce domestic output, remittance inflows should increase national income. He also stated in his research paper that, the increase in income attributable to remittances might enable the economy to realize an excess of investment over savings, through a corresponding excess of imports over exports, with a smaller drawl on external resources than would otherwise be the case. Unless the marginal propensity to absorb out foreign incomes exceeds unity, remittance inflows should always improve the balance of payments position or prevent it from deteriorating as much as it otherwise would. The increased inflow of remittances significantly improved the balance of payment position of Pakistan’s economy during the second half of the seventies and early eighties. The foreign exchange made available because of workers’ remittances also reduced the external debt, improved debt servicing ability, and decreased the nee for additional foreign loans (Burney, 1989). This is a modem process of transferring money. In this process money is remitted through telex, telephone, or mobile phone. In this process, a party can transfer money within short time. The desire person can get money instantly. The most important part of a TT is its Test Number. The test number is important to make payment. If the test number of the originating branch matches with responding branch, only then the TT payment occurs. The process of incoming and outgoing TT has been described below. It is an order to pay the account mentioned on the pay order block. Pay Order must be account payee. Commission fixed on Payment order Tk.50.00. Other Liability Account-15% VAT on commission. DD is a one kind of bill of exchange. DD is the most frequently used mode of inland remittance. DD is an unconditional order of the bank from one branch to another branch to pay certain amount of money to a certain person on demand. It is applicable outside the Dhaka City. The DD generally issued for party’s safety. If there is a huge amount to bear one place to another, then customer can do the DD and bear it to his destination instead of cash. Minimum Tk.50.00 only or 10% of Purchase Amount. When the amount will be exceeded more than 50000.00 than the commission will be counted as 1 % interest rate. It should be CROSSED CHEQUE and account PAYEE only. There is no commission for issuing a pay slip. Bank is the maker of the pay slip. A revenue stamp is required in case of payment. It has two parts; one part belongs to the account payee and the other to the bank. The first part contain the date, beneficiary, amount in figure and for which purpose the bank issue the BC and second part contains two date (issuing date and payment date), beneficiary, amount is figure and in words. Debit: Others Liability- Adjusting Accounting Credit. Over the last few years remittance business contributed remarkably in increasing fee based income of the Bank. In order to motivate and inspire the Bangladeshis residing abroad to send their hard earned money through legal banking channel, NCCBL has taken a number of steps like making remittance arrangements with different money exchange companies all over the world, participating in fairs and meetings with remitters and exchange companies, etc. which brought result beyond expectation. It is a matter of pride that the Bank has been awarded various trophies from exchange companies like MoneyGram for its initiatives in motivating people in this part of the world to avail of the opportunity of sending money through these enterprises. For the last few years, in order to inspire the Non-Resident Bangladeshis (NRB) residing abroad to remit their hard earned foreign currency through legal Banking channel, NCC Bank has taken a number of steps. As part of this, agreement with various exchange companies to cover the globe has been made, which brought a result beyond expectation. Last year, the Bank earned into a joint venture with TMSS- an NGO working for empowerment womenfolk of the country under DFID funded project called RPCF and could reach even remote areas by using its 250 outlets. This is a unique idea of extending maximum service at minimum cost to the beneficiaries. Apart from this Bank is regularly participating in various fairs around the world to motivate potential remittance senders. In 2008, the Bank received more than BDT 12098.18 million recording 62.63% increase over last years of BDT 7443.50 million. With this slogan MoneyGram has come to serve the people in transferring money all over the world. MoneyGram is committed to helping people and businesses by providing affordable, reliable and convenient payment services. An international company, MoneyGram has more than 190,000 locations in 190 countries and territories, allowing itself to economically and efficiently move money around the world, or close to home. It has been building our business for nearly seven decades – and its commitment to innovation, growth and providing personal customer service has taken itself a long way from its origins. Protecting the customers is a priority at MoneyGram. Xpress Money is the favorite global instant money transfer brand of millions of satisfied customers around the world. For whom its strong agent network spanning five continents constantly connects with their loved ones wherever they are, with passion! Xpress Money is registered in the United Kingdom with Global Head Office in Abu Dhabi, the UAE. We aim to offer the best choice of flexible Money Remittance services specifically designed to address the needs of today’s diverse, rapidly changing global community, allowing individuals to send and receive money worldwide in a timely, secure and affordable manner. We strive to offer our customers with a customized service to keep them coming back! We are a global leader in remittance and foreign exchange with direct operations spreading across five continents and 30 years of successful business history. Our award-winning services powered by the reliable network we have built across the world ensure that your money transfer and exchange needs are completely met at all times, and you stay connected to your loved ones wherever they are. We are a people’s brand which touches millions of hearts everyday across the world through our services, taking care of the remittance and foreign exchange needs of communities in the most efficient, reliable and affordable manner. Our steadfast grounding in value-laden business ethics and firm focus on customer satisfaction has given us the acclaim World’s Trusted Money Transferrer. Wall Street is committed to helping facilitate your global financial transactions. From currency exchange to money transfers, we offer reliable, professional and innovative services to make business transactions more efficient and remittances to family faster and easier. It’s about providing ways to close the deal; and ways to keep you closer to the people that matter most. Anytime. Anywhere. Remittances are higher during periods of low economic growth. The findings are plausible and consistent with international evidence. 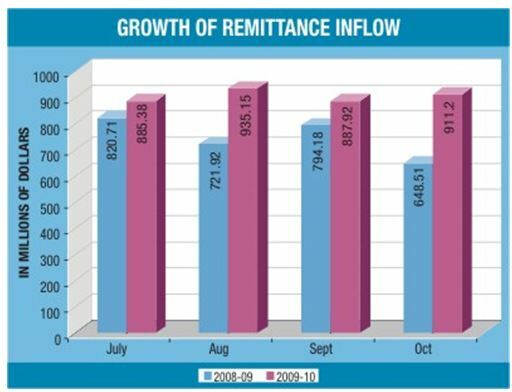 In India – another significant remittance recipient county in the South Asia region – migration, oil price, exchange rate and GDP growth has been found to be the salient macroeconomic determinants of remittance inflows as well. An interesting implication is that the impact of oil price increase on Bangladesh’s balance of payment is unfavorable. A dollar increase in oil price increases oil import payments by about $26 million whereas it increases remittances by $15 million. Thus the impact of a dollar increase in oil price on the balance of payments is a deficit of $11 million. There is a widespread concern that recent decline in international oil prices and slow down in the global economy, particularly US, Europe and Middle-East are likely to have adverse effects on Bangladesh’s remittance inflows. How bad can it get let’s say next year (FY10)? Remittance will grow by 12.4 percent, reaching $10.76 billion, if we are able to export another 610,000 workers (annual average of 2006-2008) in FY10. This is the optimistic case. Remittances will grow by 10.2 percent, reaching $10.55 billion, if the outflow of migrant workers in FY10 reverts to levels observed before the recent oil price boom—350,000. This is the base case. Remittances will grow by 8.5 percent, reaching $10.38 billion, if the outflow of migrant workers in FY10 is only 50 percent of the base case—150,000. Not too bad even in the worst case scenario! The global competition of exporting manpower is increasing day by day. The demand for skilled and professional personnel is increasing. But Bangladesh is still far behind to export skilled and professional personnel than some other top remittance recipient countries. As a huge labor surplus country from 1976 to May 2007 total 4,824,072 people migrated temporarily from Bangladesh, According to a statistics of Bangladesh bureau of manpower, employment and training (BMET). There is no information about trade wise profession of Overseas Employment in any Government Office. BMET classified temporary migrant population into four categories, such as professional, skilled, semi-skilled, and unskilled. Mr. Sudarshan Banik, statistics officer of BMET inform this reporter that, Doctors, engineers, nurses and teachers are considered as professionals. Manufacturing or garments workers are considered as skilled. Tailor, mason etc. as semi-skilled workers. Housemaid, cleaner, laborers are classified as unskilled. Most of the short-term migrated people from Bangladesh were in semi-skilled and unskilled categories. During last 31 years 177,550 (3.68%) Professionals, 1,556,217 (32.26% of total) Skilled, 745,566 (15.46%) semi-skilled and 2,344,739 (48.60%) un-skilled people migrated from Bangladesh. In early 1990s the growth of short-term migration increased dramatically. In 1976 Bangladesh exported only 6,087 people. In 2006 the number of migrated people was 381,516. In 1996 it was 211,714. In 2007 the growth rate of manpower export is very high. During January to July total number of exported manpower was 3, 35,098. It is more then double compare to same period of previous years. Remittance earning of Bangladesh is also increasing significantly every year as a result of growth of manpower export. In FY2007 Bangladesh received $41298.56 millions as remittance. FY2006 it was $32274.63 millions. Till now middle-east is the main source of remittance for Bangladesh. A $3073.54 millions of total remittance was received from KSA, Bahrain, Kuwait, Oman, Qatar, UAE, Libya and Iran. The main source of remittance of Bangladesh is migrant workers living in Kingdom of Saudi Arabia, which contributed 39.3% remittance during 2005 Fiscal Year. Remittance has economic benefit both at macro and micro level. According to a Working Paper of International Network of Alternative Financial Institutions (INAFI) Bangladesh, in 2004, the formal remittances contributed 6% of GDP. If informal channels were included this contribution reaches 9-10% of GDP. In 2004-2005 fiscal year remittance was 44.47% of export receipt. The poorer the household, the more impact or benefits remittance income can have alleviating poverty. The proportion of foreign aid was only 38.74% of remittances in 2004-2005 fiscal years and foreign direct investment was only 13.58% of remittances in 2003-2004. The government has taken various initiatives to encourage remittance flow and utilize it for economic development. A separate ministry has established to ensure welfare of the expatriate workers and increase of the overseas employment. Moreover, the government has established different sister organization like Bureau of Manpower Employment and Training (BMET), Bangladesh Association of International Recruiting Agencies (BAIRA) etc. Remittances are one of the major sources of the foreign currency earning that maintains balance of payment of Bangladesh. So the government should give more emphasis to increase the flow of remittances. The major future challenges that are identified for Bangladesh for harnessing remittances for economic development are lack of skilled and professional personnel and diversify the manpower export market. To boost the flow of remittances the government should establish more technical institutes, develop new foreign policy, encourage the utilization of remittances in productive investment and create enabling environment to invest remittances in capital market. Remittance growth stood at 21.23 percent in the first four months of the current fiscal year, despite bleak forecasts by the World Bank. The July to October period measured the remittance inflow at $3.61 billion, which was $2.98 billion in the same period last year. Bangladesh recorded $911.20 million in remittance in October, up from $887.92 million a month ago, according to central bank data. Remittance crossed the $900 million mark for the third time in 2009. The figure was $935.15 million in August and $919.10 million in June. Due to the large remittance inflow, the foreign currency reserve is increasing. It was recorded at $9.56 billion. The foreign exchange reserve that was $5.82 billion in June rose to $7.74 billion in July. In August, the reserve crossed $9 billion. The WB projected Bangladesh will record remittance growth at 12.3 percent at best and the least at 8.4 percent for the current fiscal year. The WB also said the outflow of migrant workers in Bangladesh has slowed significantly. In July, the migrant outflow dropped by 57 percent compared to the same month last year. The impact of global recession became evident in the second half of fiscal 2009, when the outflow of migrant workers declined by 47 percent. The number of migrant workers finding employment abroad has declined by 33 percent in fiscal 2009 — a total of 650,000 migrant workers got a job abroad this year, compared to 969,000 last year. The report also said the economic outlook in the Gulf Cooperation Council (GCC) countries will be decisive for Bangladesh. The GCC countries together accounted for 63 percent of total flows in fiscal 2009. Saudi Arabia was by far the largest source of remittance ($2.9 billion), followed by UAE ($1.8 billion). The outflow of Bangladeshi workers to GCC member countries was affected by the global economic crisis. In fiscal 2009, about 4, 61,000 workers immigrated to the gulf, compared to 6, 57,000 in the last year — recording a 30 percent drop. However, the report added the recent increase in oil prices to around $70 a barrel should reduce the risk of a fall in remittance from Bangladeshi workers in GCC countries. The WB report said a regression exercise revealed the key determinants of changes in the level of remittance inflow are the number of workers finding employment abroad every year, the oil price, the exchange rate and the GDP growth rate. The results show: an additional migrant worker brings in $816 in remittances annually, a dollar increase in oil prices increases annual remittances by nearly $15 million, depreciation of the exchange rate by one taka increases annual remittance by $18 million and remittances are higher in times of low economic growth. A Bangladesh Bank official said the number of outbound migrant workers dropped in the current fiscal year but a large number of poor expatriate Bangladeshis are still staying abroad and sending remittance. Remittances by Bangladeshi expatriates stood at over $886 million in the first month of this fiscal year, marking an 8 percent growth over the same period of previous year. “It’s a normal trend of inward remittances. We expect that the flow of remittances would increase this month ahead of Holy Ramadan as well as Eid festival.” – A senior official of the Bangladesh Bank (BB), the country’s central bank, told AHN Media in Dhaka, preferring anonymity. The remittances from Bangladeshi nationals working abroad were estimated at $886.40 million in July this year, a fall by $32.70 million from the previous month. In June 2009, the remittance was $919.26 million, according to the central bank statistics. The remittance earnings in July came as a continuation to last fiscal’s trend and record inflow of $9.689 billion. The growth in 2008-09 was 22.42 percent over fiscal year 2008-09. The BB official also said the central bank has taken special measures to allow more exchange houses particularly in the European Union (EU) to remit money to the country aiming to increase the flow of remittances from the Euro Zone. The flow of inward remittances witnessed a significant fall from three major EU countries – the United Kingdom, Germany and Italy -in the fiscal period that ended on June 30 following the ongoing economic recession. The country’s foreign exchange reserve stood at an all time high at $7.84 billion for the robust growth of remittances from Bangladeshis working abroad, the central bank officials confirmed. Currently, some private commercial banks and state-owned commercial banks are working to increase the flow of remittances from different parts of the world including the Middle East, United Kingdom, Malaysia and Singapore to meet their foreign exchange demand. “We are trying to increase the flow of remittances establishing new arrangements with overseas exchange houses and banks so that our overseas workers can find it easy to send money back home.” – Managing Director and Chief Executive Officer of the National Credit and Commerce Bank Limited told AHN in the capital, Dhaka. Dhaka, Bangladesh (AHN) – Bangladeshi workers abroad sent home a record $6.48 billion as remittances in the first seven months of the current fiscal year, registering a 20.89 percent growth over the same period in the last fiscal year. The remittances from Bangladeshi nationals working abroad were estimated at $950.92 million in January, up by $77.06 million from the previous month. In December 2009, the remittance was $873.86 million according to the central bank statistics, released on Wednesday. “The inflow of remittances is still at a satisfactory level,” a senior official of the Bangladesh Bank (BB), the country’s central bank, told KAHN Media in Dhaka, adding that most of the Bangladeshi expatriates sent higher amount of remittances to their relatives during the period under review to facilitate the current Boro cropping. Bangladesh received $6.484 billion during the July-January period of the fiscal 2009-10 against $5.363 billion in the same period of the previous fiscal, the BB’s data showed. The latest figure shows that despite the slowdown of overseas jobs, inflow of remittances has maintained an upward trend — a continuation of last fiscal year when remittances grew 22.41 percent, the central bank officials said. The BB earlier took a series of measures to encourage expatriate Bangladeshis to send their hard-earned wages through formal banking channels instead of the illegal “hundi” system in order to boost the country’s foreign exchange reserves. Four state-run commercial banks and dozens of private commercial banks have also stepped up efforts to increase remittance flow from the Middle East, the United Kingdom, Malaysia, Singapore, Italy and the United States. “We are establishing new contacts with foreign exchange houses so that our overseas workers can find it easy to send money home. We’re also trying to set up our own exchange houses in different parts of the world,” Managing Director and Chief Executive Officer of the Agrani Bank Limited told KAHN in the capital, Dhaka. The country’s foreign exchange reserves stood at $10.13 billion on Wednesday due to the robust growth of remittances, the BB officials confirmed. Honest and Reliable Employees: All of the employees of NCC Bank are honest and reliable. They are always devoted themselves to the works for better customer service they have no corruption report. Adequate Finance: NCC Bank Bangladesh Ltd. has adequate finance. That is why; they need not to borrow money from Bangladesh Bank or any other banks. More funds for Investment: For adequate financial ability they can provide loan to the more investment clients. Lack of Adequate Employees: Number of employees is fewer than the volume of works which creates problem for prompt service. Lack of up to date equipment’s: NCCBL is not widely engaged in modern technologies and equipments. Religious Minded People: Most of the people of our country are badly eager to increase their income. So they accept the deposits with satisfactory interest of NCCBL. Special Image: NCCBL has created special image to the people as a more reliable bank. People believe that if they keep their money in NCC Bank; it will be more secured than other banks. Rules and Regulation: The less use of technologies and slow improvement of NCC Bank Ltd can be a bigger threat for itself. More Competitors: There are a lot of competitors in banking sector of Bangladesh. So it’s a great threat for them. There are not only the conventional banks but also some other Islami, Specialized and Scheduled Banks in the market as their competitors. NCCBL is the pioneer of Commercial Banking Business in the private Sector in Bangladesh. In general banking department; NCCBL follows the traditional banking system. The entire general banking procedure is not fully computerized. There is only one computer in remittance section. That’s why the service is not prompt as the customers desired. It has lack of technological equipments. NCCBL is not using Data Base Networking in Information Technology Department. According to the opinion of some client’s introducer is one of the problems to open account if a person who isn’t new as a client wants to open an account it is a problem for him/her to manage an introducer for a regular account. The officers in the general banking department produce voucher manually and send them to posting officer to post them in the computer. They usually do not get involved themselves in generating voucher by computer. Remittance, both local & foreign is effective manner of customer Service. NCCBL needs to improve its most earning assets to increase its earnings. It should take various attractive schemes in this regard. It has to ensure uniformity in branch performance. For this purpose various training programs and workshops should be launched. Commercial Banks’ Investment in agriculture and rural sector is low compare of other sectors. It should give emphasis to promote agro-based industry. NCCBL has to start extensive on line banking in order to keep pace with 21 century’s challenge. NCCBL has to focus on modern banking service more. Although it has an honest group of employees, more care to improve human resource should be given. Full computerization of all activities of NCCBL should be introduced. The Banking sector is a sector at the one side, and it is the lubricant of the entire economy on the other side. The importance of banking sector in Bangladesh is more significant as the informal sectors, such as wholesale and retail trading, transport, construction and other small scale services play important role in this economy. Hence proper utilization of the banking channel is more important in Bangladesh. The basic difference between Commercial Banks and the Specialized and Scheduled Banks is that the Commercial Banks do business on general activities in financing businesses on a specific rate of interest, where as the other banks operates specialized activities and with interest as well. NCC Bank could also maintain the capital adequacy ratio and provide for loans and advances considered bad and doubtful of recovery up to the level as stipulated by the monetary authority of the country. The average growth rate of deposits and lending of the Bank is very good and even on a few occasions the growth rate is low. The activities of NCCBL is so far diversified attempts are gradually being made for increasing the number of self reliant projects, providing assistance to institutions/organizations and individuals. As a market leader offering banking services based on commercial banking rules and regulations by Bangladesh Bank, the profitability trend of NCC Bank Ltd. has been quite impressive. The Banks ability to keep its returns on asset well above the industry average reflected it resilience to possible shocks in the banking system. The gradual and successful globalization of general banking coupled with growing awareness of the people about its financial and social benefits makes it clear that the next century is going to be the century of modern, faster and online banking.